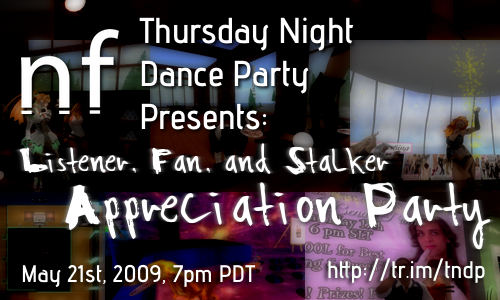 This entry was posted in Events and tagged Appreciation, Thursday Night Dance Party, TNDP. Bookmark the permalink. Pingback: Second Life, First Hand » Blog Archive » Friday Focus Quick and Deadly: Tattoos and Textures. It was real fun to attend your events and the week seems to be ended quite well. Well this is so nice of you appreciating us but the crowd comes only because they like you and enjoy your work. Yeah I would look forward to the details about your shows. Dance parties are always a great place to enjoy the life I always do dance to make my life great. I love the way the people enjoy their life in these dance parties in their life. A lot of dancers do practice hard to perform well in their life. I bet this was a great event, when is the next one?